Amongst the many personality traits prominent across the world is what I believe would be called the cookie type preference. It's why there are so many different kinds available in the groceries- crispy, soft, hard, chewy, cakey, more chips, less chips, white chips, chocolate chunk, nuts...I could go on! As a kid a reward for going grocery shopping with my mom and helping would sometimes be a box of those already prepared but very raw cookie dough balls in the box from the frozen aisle and you guessed it, they never made it into the oven because we would eat them how they were. Slightly frozen still, the chips were so cold and the batter thick, stickey and gooey, the kind that got stuck to the roof of your mouth. Those were the best. At the time "raw" was my preference. Not the healthiest choice, but oh so good! As an adult I think I prefer crispy. And guess what, I think I have officially found the perfect balance between the two in these caramel cookie bars. And don't worry, they do get baked and I don't recommend eating them raw either. 1.Preheat the oven to 350. Grease a square cookie pan. Measure out and sift the flour and confectioners sugar and combine with salt in a large mixing bowl. Add the oil and mix until you have quite a thick dough consistency. Take the mixture and press it into the bottom of the square pan evenly so it reaches all of the edges. Bake it for 25 minutes and then remove it from the oven to cool for 10 minutes. 2. In the meantime prepare the caramel part. Combine the caramel sauce, eggs and vanilla almond milk and mix well before pouring it over top of the already baked bottom half (crust). Then pour the chocolate chips over the top as evenly as possible and put it into the oven again for another 25 minutes. The top will be slightly soft when you pull it out of the oven. As long as it's not runny and overly liquid like, this is fine. Allow it to cool completely before cutting it into squares and serving. 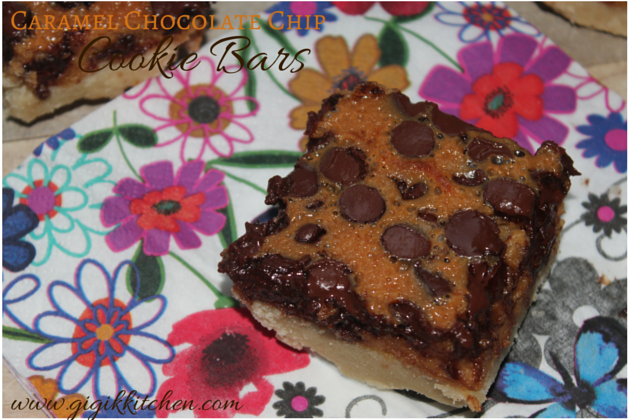 I really hope you will give my Caramel Chocolate Chip Cookie Bars recipe a try! Don't forget to leave me a comment below letting me know what it was like if you do! And feel free to tag me on Instagram or post your photo on my facebook page as well.